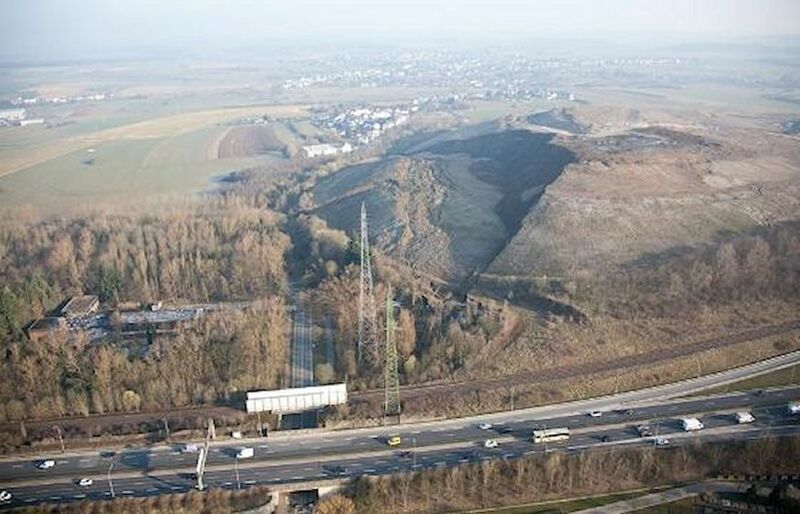 Worrying news that the landslide which shut a motorway in Luxembourg yesterday contained radioactive waste. Gibraltar frontier delays are getting worse. Next week could see a re-run of motorway blockades in the Netherlands. Scientists develop glow in the dark roadside shrubs, and infra-red road rage detectors. Exact nature of material as yet unknown. The landslide that shut the A4 motorway in Luxembourg on Friday morning contained radioactive material. It is highly unlikely the slag heap at Esch-sur-Azette contained directly hazardous material like nuclear waste. We contacted Copernicus to find out the exact nature of the ‘radioactive material’ but are yet to hear back. The landslide was first noticed by a passing motorist on Thursday night. Material from the adjacent slag heap had slipped 30m to completely block the CR-106 which runs underneath the nearby A4. Emergency services worked overnight to stabilise landslip which also threatened electricity pylons beside the A4 motorway. The road was closed in both directions for a time but reopened in the morning. update: we passed the story to Wort.lu, Luxembourg’s News in English website who wrote their own version, only they call it ‘hazardous waste’. update 18.03.14, 10:33: the Luxembourg Environment Agency says the landslide does not pose any extra risk. update 18.03.14, 16:09: the Luxembourg Health Ministry says it is monitoring radiation levels. Waste containing significant amounts of uranium and thorium was dumped at Esch between 1975 and 1987. It is now believed to lie 30-35m from the edge of the landslide but apparently has not been affected. roundup: GIBRALTAR QUEUE WATCH. Mega queues continue. All hopes that the situation would settle down are surely now fading. Delays reached 2h30 at the Spanish frontier today. NETHERLANDS. More rolling road blocks are on the way, possibly by the end of next week, after the latest round of negotiations between employers and truckers’ unions broke down today (article in Dutch). Meanwhile, glow in the dark road side plants are set to become reality, from the same inventor – Daan Roosegaarde – who is shortly to trial the first light responsive highway (more on that soon). DRIVING. An infrared camera placed behind the steering wheel can detect traces of anger or disgust on a driver’s face. Possibly help in the fight against road rage (how, by pinging?). Developed by researchers at Lausanne Polytechnic in association with Peugeot-Citroen.